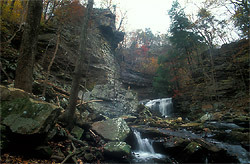 In the northeast corner of Alabama, three creeks form a canyon that runs from the top of Sand Mountain, and in under two miles, drops more than 1,000 feet into the Tennessee River. 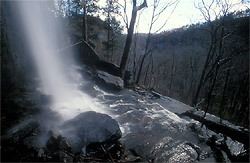 Known as Pisgah Gorge, yet unknown to the vast majority of Alabamians, this is one of the most beautiful natural areas in the state. As you enter the town of Pisgah from the south, turn left at the sign to the Pisgah Civitan Park. Walk into the woods behind the ball field and you will soon come to a trail that follows the rim of the canyon along Little Bryant Creek. It starts at an old dam site and then follows the rim of the canyon above three waterfalls. 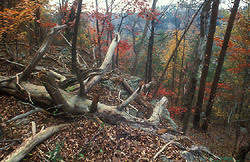 The trail ends at an inspiring overlook atop a rock bluff. 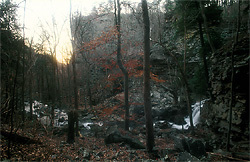 From there you can look upstream to view the second waterfall or look far down the canyon toward the Tennessee River. This is an easy hike, suitable for most anyone except for the fact that the overlook has no protective barriers. 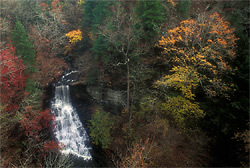 If you are up to the challenge there is a steep way down to the area below the third falls. It's not that far down. 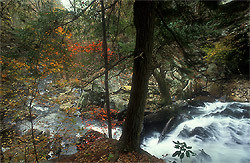 The area around the falls and upstream from it is perhaps the most beautiful place in Pisgah Gorge. 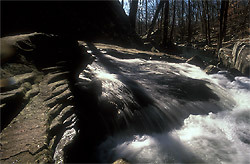 If you want to explore downstream, the Bryant / Little Bryant confluence that forms Jones Creek is not far. There is no trail. Instead, there are thousands of rocks to negotiate to get there. They sit on top of each other, some like a cocked gun, waiting to be stepped on before they find their final resting place. It's difficult walking when stones move beneath your feet and it's hard to tell which ones will move. I touched the side of a precarious looking one, weighing two or three hundred pounds, with the leg of my tripod and it shifted onto it, bending it permanently. 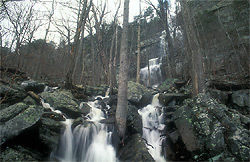 You can find a picture of the confluence in The Natural Beauty Of Alabama. Hiking up Bryant Creek from the confluence is an option but I have not done it. Or hiking down Bryant Creek from Co Rd 376 to the confluence might be a better option and then up Little Bryant Creek to Pisgah Civitan Park. Of course this requires two vehicles. If you explore this, let me know the results. If you head downstream from the confluence it is called Jones Creek, it isn't far before you find a small branch flowing down the side of the canyon. You can pick your way up the side of the canyon through the stones to the fourth falls. It is unique and if there is enough water, it's worth the effort. I haven't been much further downstream on Jones Creek because hiking through the rocks really wears you out. It's some of the most difficult hiking, if you can call it that, in Alabama. If you have a second vehicle it might be a all day hike down to the Tennessee River. Since I haven't done it to confirm how long it takes, go at your own risk and let me know the results. 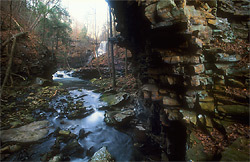 This beautiful Alabama gorge has remained pristine for thousands of years. 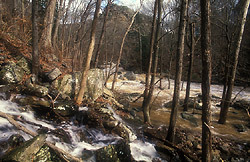 It empties into the 'Tennessee River at Jones Cove, which is said to be the last place in Alabama where Boy Scouts were allowed to swim in natural waters. The last time I was at Pisgah Gorge it seemed as pristine as anywhere in Alabama. Recently, however, a 4,000-count hog factory has been built between Bryant and Little Bryant creeks. 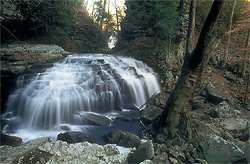 In spite of waste management controls, I would wager that storm water runoff occasionally makes its way into the gorge. Sand Mountain concerned citizens tried to block the building of the hog factory, but it was only a matter of time. The first time I took my son, age twelve at the time, to Pisgah Gorge, I made an effort to counter his dare devil spirit. We started at the upper waterfalls and while I tried to concentrate on compositions, he became occupied with defying danger. I stopped twice to point out hidden dangers but of course it fell on deaf ears. He didn't grasp the consequences of carelessness until later down in the canyon when I slipped from a bolder I was climbing. I slid feet first, scraping and bruising myself until my feet hit the ground, then fell backwards into a rare spot of water that was void of rocks. By the way, I find it most annoying when someone shouts to you while you're falling backwards under water. You have a reflexive reaction to assure them you are OK, but time slows while you sink and then wait helplessly to surface. After I shed my soggy jacket and poured the water out of my camera, the wet chill put an abrupt end to the trip. I was freezing and couldn't get out of the canyon fast enough, but at least the trip taught my son a lesson. A few miles away, on the other side of the town of Pisgah is another Alabama treasure, Gorham's Bluff. At the top of the bluff you can see miles down into the Tennesse Valley across the river. With a bit of effort, you can walk through the woods from the top of the bluff down to the Tennessee River. Although a steep grade, it is not nearly as difficult as walking down into Pisgah Gorge. 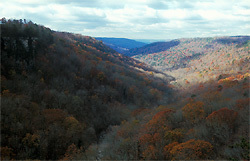 One of America's top rated bed & breakfast lodges offers a prime view. They also rent cottages, offer gourmet dining and occasional entertainment in their amphitheater. Gorham's Bluff has been one of Alabama's best kept secrets.